A dental crowns is used to restore a tooth that has been broken down or weakened by decay or a very large filling. A dental bridge is one of the methods used to fill the gap left by a missing tooth. Dental crowns are routinely used to restore a tooth that has become too weak or damaged through injury or decay to be able to use a conventional filling. A crown (sometimes also called a cap) may also, for example, be used after root canal treatment to restore the aesthetic appearance of the tooth and provide it with additional strength. Porcelain crowns: made entirely out of porcelain, these crowns can look very natural but are not as strong as bonded ceramic and are therefore most often used for front teeth. Ceramic crowns: this modern material contains no metal and provides both strength and a highly aesthetic appearance, making it suitable for use in all areas of the mouth. Gold alloy crowns: gold is one of the oldest materials used for crowns. Today it is mixed with other metals to provide better strength, which makes it a very hard-wearing restoration. These crowns are silver or gold in colour. We provide an advanced type of ceramic crown using a process called CEREC. This process uses digital technology to manufacture a ceramic crown fitted in one visit. 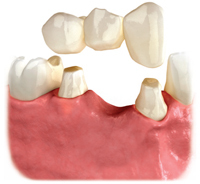 A bridge is another form of dental crown which is used to fill a gap left by a missing tooth. Unlike a single crown, which is placed on top of the remaining healthy part of a tooth, a bridge makes use of the teeth adjacent to the gap to provide support. Why should I consider replacing a missing tooth ? Leaving a gap after the loss of a tooth can mean your ‘bite’ is affected, because the teeth adjacent to the empty space can lean into the gap and alter the way the upper and lower teeth bite together. This can then lead to food getting stuck in the gap, which can cause both decay and gum disease. What is the alternative to having a dental bridge ? Another way to replace a missing tooth is to have a dental implant fitted. This is a completely different form of treatment from a dental bridge. A dental implant consists of a titanium rod carefully placed in the jaw to provide a strong support for a dental crown which then mimics the appearance of a natural tooth. One of the many advantages of an implant over a bridge is that this form of treatment doesn’t require the adjacent healthy teeth to be grinded down to fit a bridge.